ICY COUTURE Crystal desk home office phones became an instant hit after its exposure on the "Khloe & Lamar" Reality TV show. Fancy ICY COUTURE Home Office phones, bedazzled with thousands Swarovski crystals, will impress everyone who'll sees it! 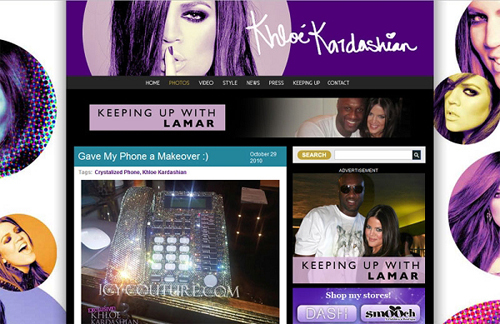 KHLOE & LAMAR, ICY Couture Crystal Home Office Phone made for Khloe Kardashian. Bling Your Desk Phone! KIM KARDASHIAN ICY Couture Crystal Home Office Phone. 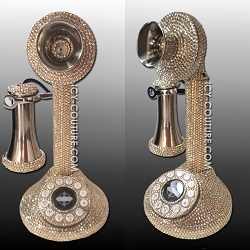 Bling Your Desk Phone! ICY Couture Crystal CANDLESTICK PHONE. Whats Your Color? Crystal Clear ICY Couture HOME OFFICE DESK PHONE. Whats Your Color? ICY Couture Golden Shadow Crystal Home Office Phone. Whats Your Color? ICY Couture Classic Brown Crystal Home Office Phone. Whats Your Color? ICY Couture "Lucky Peridot" Swarovski Crystal Home Office Desk Phone. ICY Couture DEEP RED Swarovski Crystal Home Office Desk Phone. ICY Couture MONEY GREEN Swarovski Crystal Home Office Desk Phone. CORDLESS PHONE HANDSET with Swarovski Crystals. Whats Your Color? Phone styles subject to availability. If you have specific phone in mind, please send us your own for ICY Couture make over.